Naturasil for Scars is proven to prevent scars when applied after surgery or injury, and reduces old and new scars. Naturasil for Scars is a great alternative to expensive steroid treatments or cosmetic surgery. It is an all-natural treatment method that also works well on bodies that have gone through sudden changes including women during and after pregnancy, teenagers during puberty, scars from accidents, bruising and scarring from plastic surgery, and people who have suddenly gained or lost weight. Apply a few drops to affected area 2-3 times per day. 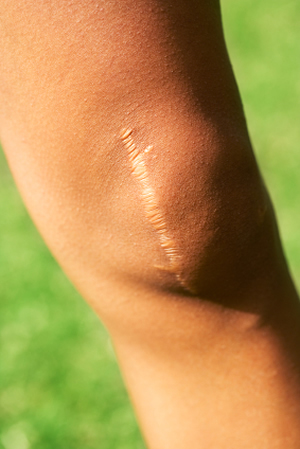 The scar will reduce in redness and appearance with continued use over 4-6 weeks or more. The active components of Naturasil Scar Treatment are nerol, trans fatty acids, geraniol, ketones, and pinene. These compounds are found in the plant extracts helichrysum, rosa mosqueta, German chamomile, lavendula augustifolia, and three additional plant extracts that have well documented skin regenerative properties. The topical application of these extracts are lipophilic and absorb into your skin as soon as they are applied.